Lego Group has built a life-size model of the Bugatti Chiron using nothing but Lego Technic and a tremendous amount of patience. The car contains over a million pieces of Lego Technic, with 2,304 motors and 4,302 gear wheels. It doesn't just look impressive, either – the model can hold two passengers, and travel at speeds over 20kmh (though the seats might be a little hard). The car's exterior is a 'skin' made from thousands of interconnected triangular pieces, and the interior is a faithful replica of the original, right down to the instruments on the binnacle and the Bugatti logo on the detachable steering wheel. There's no glue involved. 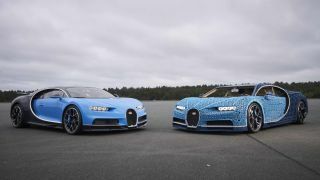 Designers and engineers from Lego's factory in the Czech Republic invested over 13,000 hours designing and building the car, which made its debut at Ehra-Lesein proving ground in Germany, where the actual Chiron was first tested. “This life-size model is a first of its kind in so many ways and with it, we wanted to push the boundaries of our own imagination," said Lena Dixen, president of product and marketing at Lego Group. "For over 40 years, Lego Technic has allowed fans of all ages to test their creativity with a building system that challenges them to go beyond just creating new designs, to also engineering new functions." The life-sized Chiron is a little beyond the budgets of most enthusiasts, but Lego also makes a miniature replica of the car that you can build at home.